"These things I have spoken to you, that My joy may remain in you, and that your joy may be full." John 15:11 Why are so many Christians restless, worried and unhappy, even though the verse above tells us clearly that this is not what God intends for His children? In this booklet, we hope to address this question to discover God's remedy so that we might be able to say with Paul, "I have learned in whatever state I am, to be content" (Phil. 4:11). Included are chapters on : Dealing with Guilt, Seeking Peace, God Working, Peace of Mind, Confessing Our Sins, Joy of Forgiveness, Path of Peace, Following the Shepherd, Peace Assured, Trusting God, Value of Thanksgiving, Learning from Him, His Purpose, Power over Sin and Happy Living. 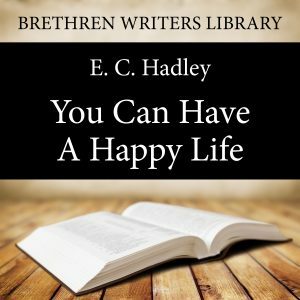 In 1925 E. C. Hadley went as a missionary to the French Sudan (now the Mali Republic) in NW Africa. While on furlough in Switzerland, E. C. met his wife, Lydia Chevalley, and together they began to dream of a world-wide gospel literature ministry. A tropical disease forced him to leave the mission field and return to the USA. In 1931, the first gospel tracts started rolling off the press at Grace & Truth in Danville, Illinois. The first press room was the kitchen, and some of the printing equipment occupied the table between meals. From 1936 to 1950 the print shop was housed in two old railroad cars that had been placed side-by-side on the property near the house. They accidentally burned to the ground after the shop was moved to its present site. The need for a monthly magazine was made evident from the feedback of many recipients of gospel tracts who asked for a steady diet of encouragement and instruction. The first issue of Grace & Truth Magazine rolled off the presses in 1933 as much needed “food for the family of God.” It has continued uninterrupted to the present time.